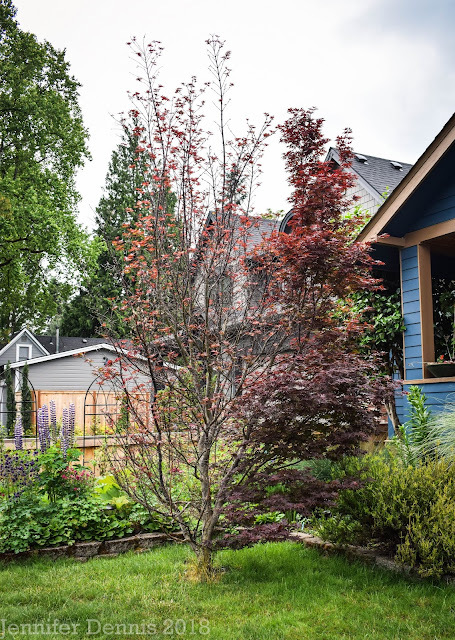 The weather in the Pacific Northwest is perfect in early spring for cool weather crops. I started my snow peas, sweet peas, chard and spinach seeds, in mid February (yes, I was a bit over-excited on a sunny weekend as I directly sowed them). Now, in early April, I've have healthy, hearty, starts growing away. Thanks to garden blogging buddy, Alison, I was gifted a bunches of onions starts. I started a new, long, box of strawberries, all from starts of my previous home's established strawberry beds. My blueberries and raspberries are leafing out nicely as well. Pretty blossoms are on the dwarf combo apple and pear trees. It's almost like a little farm out here! My herb collection is growing. I've had to start over a bit as some plants did not survive the move last summer. 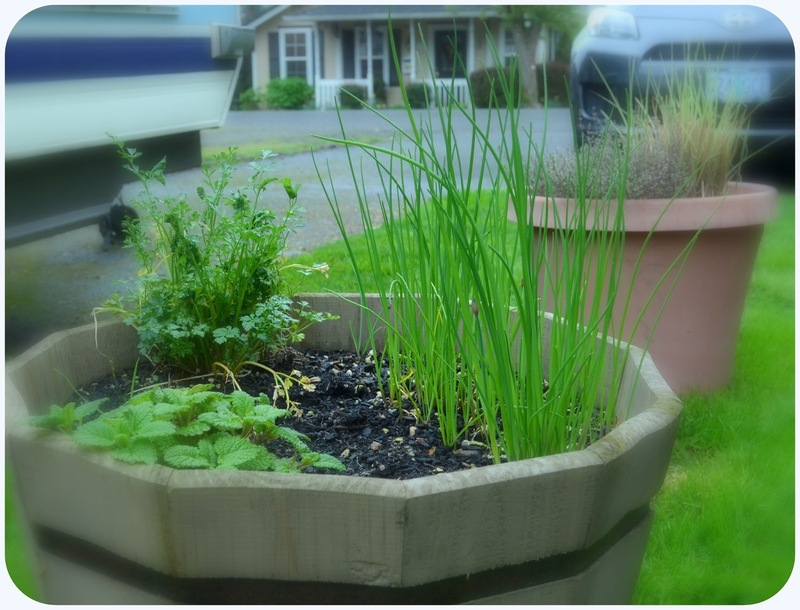 Right now my chives are looking healthy, along with parsley, lemon thyme and lemon balm. I hope to greatly expand my herbs this year. Plans oh, happy plans! Look how great all your seeds did! I remember you planted yours a little before mine, but I think I must still be doing something wrong. 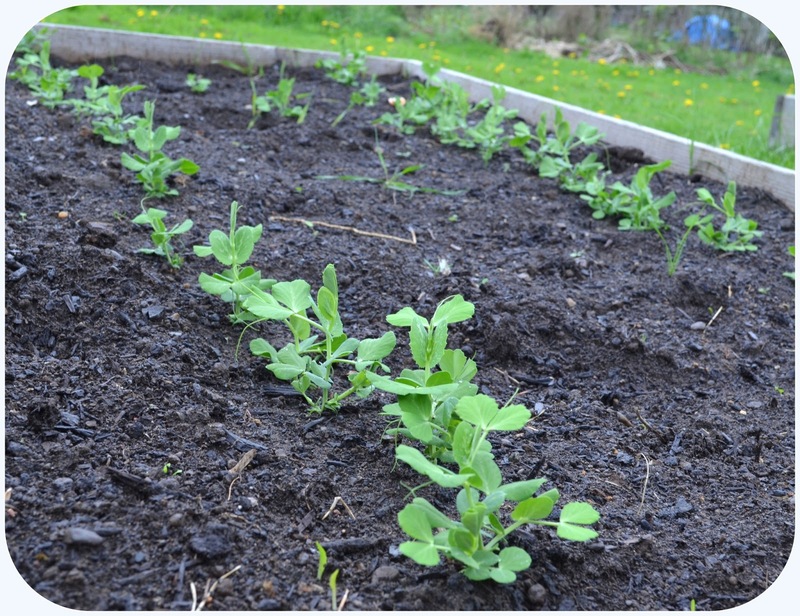 Peas are the only thing sprouting for me. My youngest daughter planted some chard seeds and they are under grow lights sprouting like crazy. So glad all your fruits and veggies are off to a great start. I see my pear and apple trees close to blooming. Can't wait to see how this all looks in another month. Wow! Everything looks so good. My seeds in the greenhouse are not up and I'm getting impatient. I put in some swiss chard, carrots and lettuce. The spinach I planted last year does look good. The weather is teasing me. The orchard looks good and is starting to melt off. 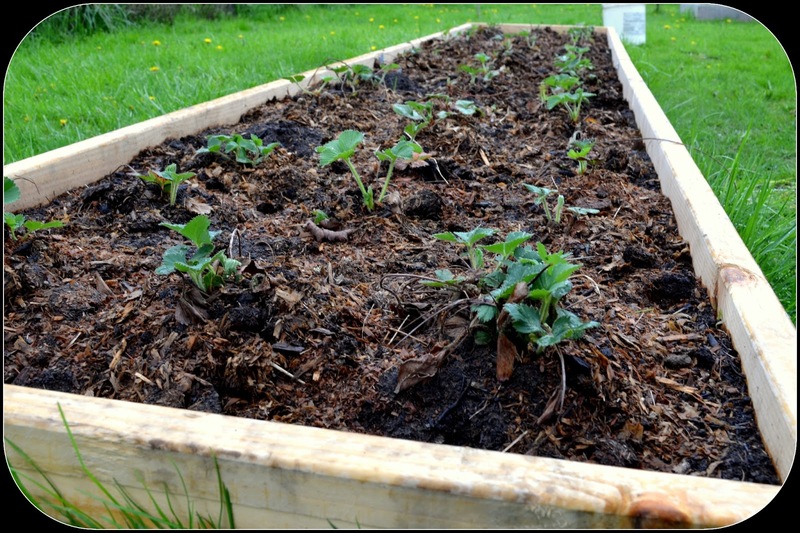 I think you will really enjoy having your raised beds. It just makes thing so much eaiser. Can't wait to see how it all pans out. Happy Gardening. I wanted to start my peas last weekend, but our neighbour who is a retired pea farmer said to wait a while...but I need to get my sweet peas in soon. I am a little behind (started 1st of march) but you are right the weather has been perfect. It seems no matter how many beds, there is always need for more! New beginnings are always hard, but it looks like yours are sprouting well. Everything is looking good! Whenever I see your strawberries it makes me want to plant some. Maybe next year, I need to find a good spot for them and get it ready. One year I got excited too early, and sowed peas on a nice day in February. I don't think they did any better than any other year though. What other herbs do you want? Basil is usually easy from seed. I'm envious of how far on you are - we haven't really made a start! Oh Jenni ~ everything looks great and healthy. I am excited for you and inspired too. You have a fine set of young plants there Jenni. They are a long way ahead of mine. Funnily enough I'm actually hoping for some rain this coming week, because the soil in my garden is incredibly dry. Your raised beds look wonderful. Such healthy soil and plants. Despite all the crappy weather, things look great. Ahhh, the promise of abundance to come! I feel like a "cheater" : ) now as my dad just gave us a large assortment of seedlings, and I bypassed the sowing and waiting phase. We are grateful, though, to be planting swiss chard, kale, collards, arugula, basil, zucchini and four varieties of tomatoes. We'll sow some other seeds on our own - radish, carrot, cucumber. 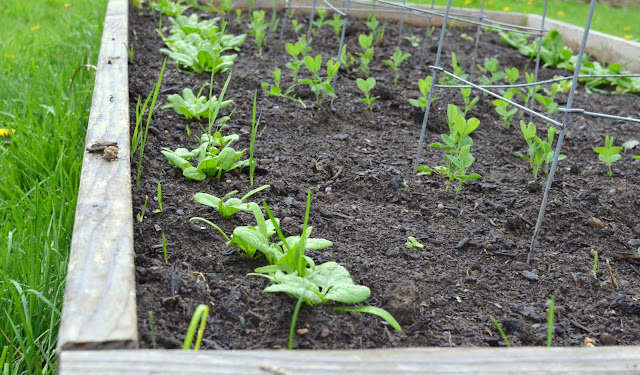 Your spring vegetables, like your life in your new home, seem full of the promise of wonderful things to come! Your veg beds and plants look fantastic. Hope you have an abundant harvest this year. That's an amazing early start. Looks like you'll be harvesting around the time I'm sowing!